The aim of Klondike Solitaire is to organize the deck into four columns, one for each suite. Each column is required to be ordered specifically from Ace to King. The game continues until you are unable to make any further moves. You can click and drag a card or set of card to a new pile. The card game Solitaire has been around since at least the 1700’s where there is written evidence to support that in Northern Europe it was regularly played. According to the Oxford Dictionary, the first European record of the game Solitaire was during 1746, but it is hazy as to whether this was the card game itself or a version played with marbles and pegs referred to as Peg Solitaire. During the early 1800’s, Solitaire made its way into France and Napolean Bonaparte himself was reported to have played in during his exile at St. Helena in 1816. Patience, as it was often called, was from then on commonly played by the French population, with many of the terms from the game having originated from the French language itself. Solitaire first began to appear in British publications from 1874, when it was mentioned in Lady Cadogan’s Illustrated Games of Patience. From then on it has evolved into what we regularly see online or bundled with our computer software. 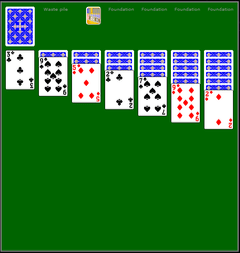 1987 saw the first ever commercial computerised version called Solitaire Royale, which was available for both PC and Mac formats. 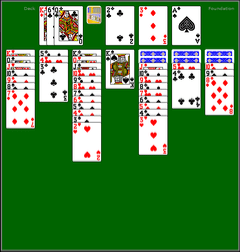 1990 saw Microsoft Windows bring out what was commonly known as Windows Solitaire, which in reality is actually the classic Klondike Solitaire game itself. As to why Solitaire was actually invented, there is no definitive answer. Some researchers theorise that it arose from the popularity of other card games at that time, such as tarot card reading or divination as a form of fortune telling. Scandinavian countries refer to the game as Cabal, which is a way of interpreting the Old Testament in a mystical way, while in Britain it is known as Patience. However, with no definitive answer as to the exact origins of Klondike Solitaire, it can be said without hesitation that it is one of the most popular card games worldwide, either playing with a physical pack of cards, online or through specific computer software.